Master Storyteller Sheila Arnold returns with an all-new program, sharing dramatic, historical tales about Virginia’s waterways that were part of the Underground Railroad. The stories are derived from an 1870s book written by William Still, a Conductor for the Underground Railroad and Secretary of Philadelphia Abolitionist Society. His book shares the stories of over 500 people who ran from slavery, including some who used Virginia’s locks, canals and waterways to escape. Free admission but $10 donation suggestedto benefit nonprofit sponsor Lancaster Va Historical Society. RESERVATIONS REQUESTED TO ENSURE SEATING 804-462-7280 orhistory@LancasterVaHistory.org. by Dr. Cassandra L. Newby-Alexander, PhD. Published 2017. Enslaved Virginians sought freedom from the time they were first brought to the Jamestown colony in 1619. Acts of self-emancipation were aided by Virginia’s waterways, which became part of the network of the Underground Railroad in the years before the Civil War. Watermen willing to help escaped slaves made eighteenth-century Norfolk a haven for freedom seekers. Famous nineteenth-century escapees like Shadrack Minkins and Henry “Box” Brown were aided by the Underground Railroad. Enslaved men like Henry Lewey, known as Bluebeard, aided freedom seekers as conductors, and black and white sympathizers acted as station masters. 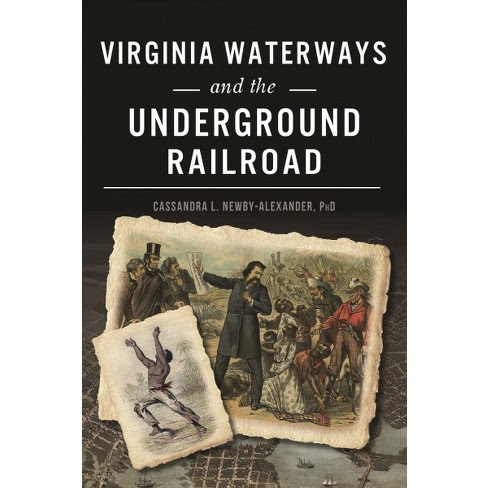 Historian Cassandra Newby-Alexander, professor of history and director of the Joseph Jenkins Roberts Center for the African Diaspora at Norfolk State University, narrates the ways that enslaved people used Virginia’s waterways to achieve humanity’s dream of freedom. Softcover, 192 pages. $23 ($21 members) includes tax. Please call or email to reserve a copy so we can ensure enough inventory, or buy online at www.mkt.com/maryball (online price may vary).